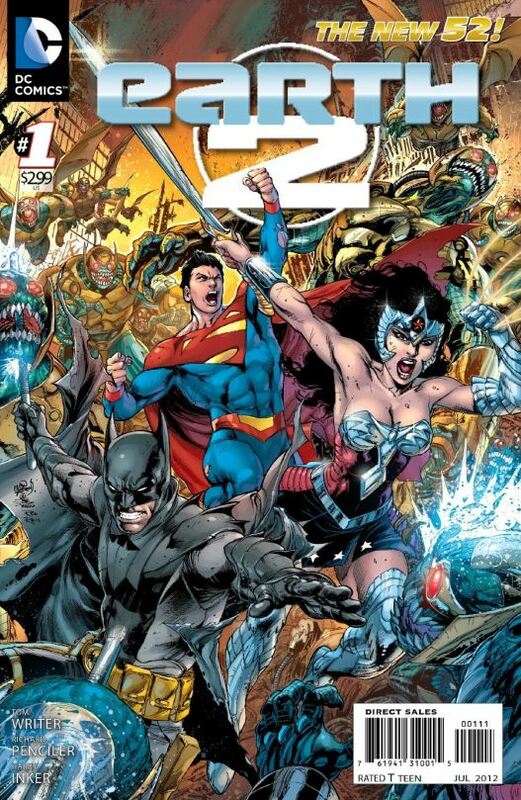 Well the first week of May brought us big things with both Free Comic Book Day and the launch of DC's "New 52 Wave 2"! 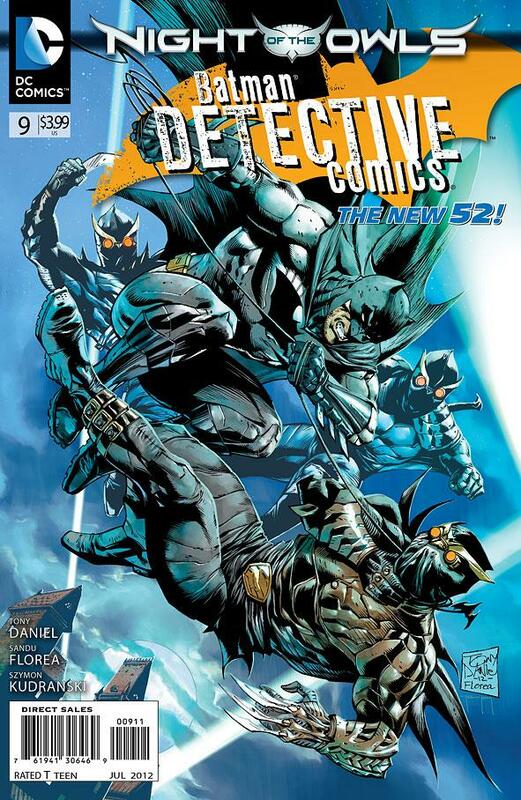 Not to mention the first New 52 Annual! I bought the annual and two of the four new #1's released last week...let's take a look! NEW! Earth 2 #1 - Our story begins on this alternate Earth as their versions of Superman, Batman, Wonder Woman, Supergirl and Robin the GIRL Wonder are fighting a battle against Parademons, the shock troops of Apocalypse, in a battle for the very planet!! The shock troopers, led by the "seemingly brilliant and unstoppable" Steppenwolf have been winning for a long time. Metropolis, like most of the world, lies in ruins! Wonder Woman is the LAST of the Amazons. Even the GODS are dying in battle! This is a much darker world than good old Earth 1!! Anyway I won't spoil it but a LOT more happens and I thought it was a really good read. I'll pick up #2 for sure and at least let the first story-arc play out. We saw a few familiar faces in issue #1 here, but there's a lot more to come I'm sure! I've never been a huge fan of alternate universe fiction but in this case, I'm in!! Find out more about Earth 2 and what else I read this week after the JUMP! 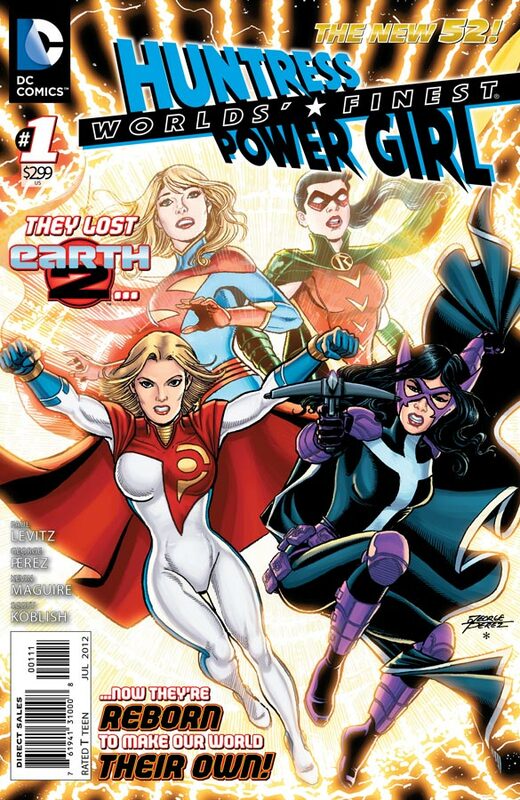 See, Power Girl used to be Supergirl on Earth 2. The Huntress was A) Robin to Bruce Wayne's Batman and B) Helena WAYNE, daughter of Bruce Wayne! You thought she was Helena Bertinelli, daughter of a mob boss right? WRONG!!! It was revealed a few months back in the Huntress mini-series that she's actually the daughter of Batman and Catwoman from Earth 2!! Intriguing! So two hot, powerful girls who are literally OUT OF THIS (well, their) WORLD! When we meet them, they've been on our Earth for 5 years, and are more-or-less established but unknown. I have a feeling that the latter is about to change! Out of the 6 new titles DC is launching this month, this was the one I was most excited about! Unfortunately, I think my expectations were TOO high, as it's a pretty run-of-the-mill first issue just pumping out a little backstory and a little characterization and throwing in an explosion or two to keep things interesting. Perfectly good comic, but it didn't have that WOW factor that I'd hoped for. Nevertheless, it has tons of potential and I'll continue to have high hopes for issue #2! This one is bound to be popular and hard to find, so buy it quick! 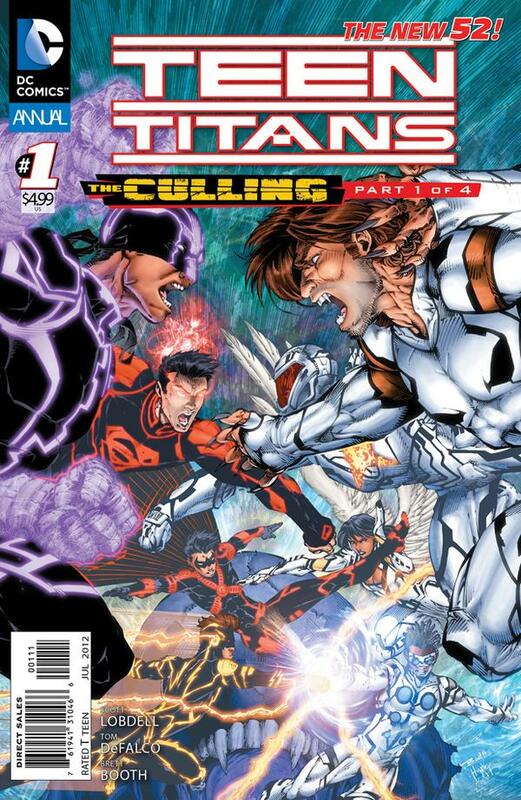 Teen Titans Annual #1 - The Culling finally begins as Teen Titans get the very first annual released in the New 52! Red Robin and the gang find themselves trapped in something called the Colony, a combination of shanty-town and well, Hell. They are their with a ton of other erm..."talented" teenagers, all collected by evil mastermind Harvest to participate in the Culling...pitted against each other, only the strongest will survive...or so the plan goes! Amongst the trapped teens are another team you may have heard of...they're called "Legion Lost" and are trapped in our time, but originally from the 31st century. They have their own book which I've never read...and of course they immediately want to fight with the Titans, as is the way of super heroes when they first meet. Gotta greet with punches! never mind that fighting amongst themselves can only be playing into Harvest's sadistic claws...what will happen when he REALLY gets going? I'm not telling but not everyone could possibly survive...could they? The Culling continues next week in Superboy #9! 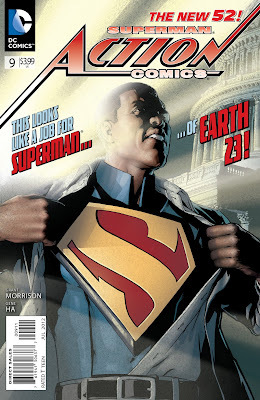 Anyway President Calvin has to fight both his Lex Luthor and then an evil robot Superman from another dimension, led to his Earth by that dimensions' Lois, Clark (who is NOT Kryptonian) and Jimmy! They're looking a little worse for wear, incidentally. Then in the second story Super Calvin has to stop a dictator from developing a nuclear arsenal and destroying the planet, even though (as Wonder Woman is quick to point out) it violates all those international rules he swore to uphold in his Presidential secret identity. As an alien, he's not even technically allowed to BE president anyway...what they don't know won't hurt them? 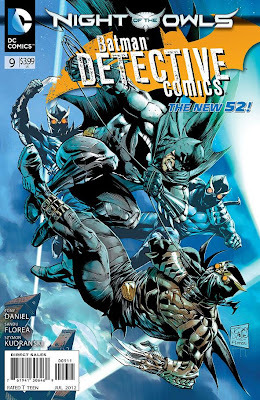 Detective Comics #9 - Night of the Owls continues here as the Talons invade Arkham Asylum in search of the guy in charge! "Jeremiah Arkham, for harbouring and encouraging criminals, the Court of Owls has sentenced you...to die." Oh one thing I really, really like and hope is a trend throughout the cross-over. We get the exact time of when everything's happening and where it's taking place so that someday, when this is all over, we can go back and read it all chronologically and see how much it makes sense! This issue is "Night of the Owls, 8:26 pm...Arkham Island." The time updates throughout the issue. Right now, reading one issue at a time is like watching a puzzle being built. I can't wait to see it all together! 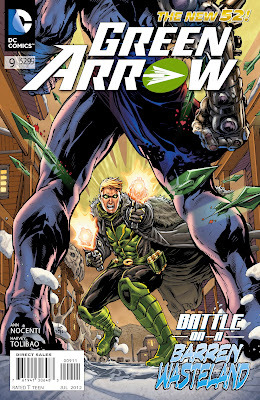 Green Arrow #9 - "I made some mistakes. I think they're going to haunt me." 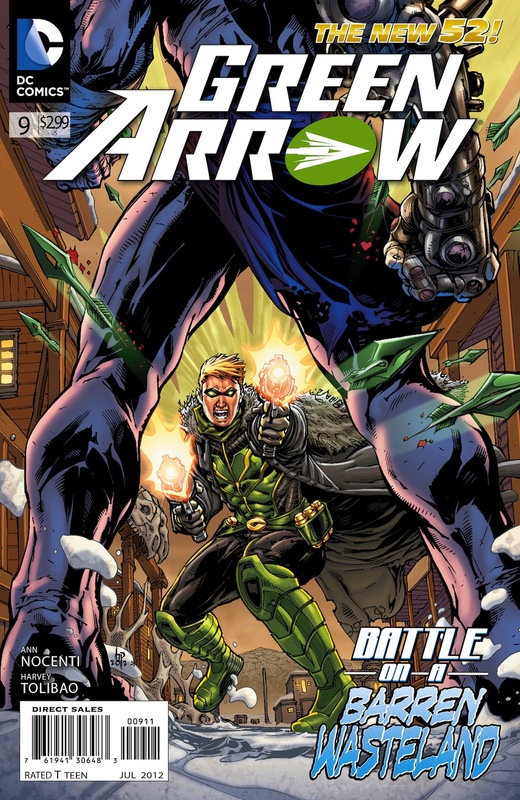 Just when I think I've mocked Green Arrow into submission, he returns with a vengeance! This is definitely the most intriguing Arrow comic I've yet read and it made me more interested than I've ever been in what's coming next! Good work new creative team! You've managed to take a character I'm predisposed to laughing off and made me take him seriously! Oh plot-wise, Ollie's still stranded in the Arctic where his new girlfriend's father and her two identical siblings are chasing him down to get their sister back and basically ruin his day. He tries to take sanctuary in a one-horse mining town, but they don't much cotton to strangers. What's a hooded, arrow-wielding stranger to do? Whatever it is, it involves dynamite and a polar bear!! Well that's it for the first week of May!! Stay tuned next week as it looks like "Night of the Owls"kicks into high gear with Batman, Batgirl and Batman & Robin #9's all being released! And of course, that's not all! 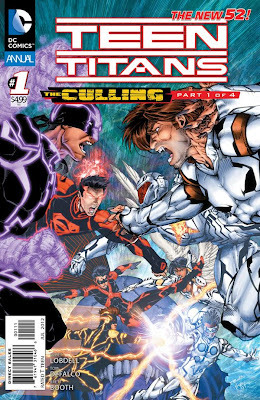 We also check in on Green Lantern, continue with The Culling and more! Gotta love new comic book day!